Paruppu Usili is a very popular South Indian side dish known by various names. Prepared using vegetables like French Beans, Cluster Beans, Flat Beans, Banana Blossom etc and steamed lentils, this dry side dish is one of my favorites. I prefer this over the regular thorans. I especially love the spiced steamed lentils. Whenever I prepare usili, I soak a little extra dal, so that I get a little more of the steamed lentil cakes. I enjoy eating these as such. 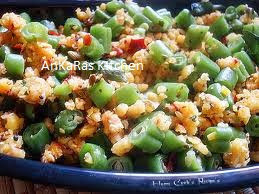 Since this is a dry curry and is very filling due to the addition of lentils, it is perfect with white rice and rasam. This is of course my preference, but it is a great accompaniment to Sambar and Mor Kuzhambu as well. Wash the dals in 2 or 3 exchanges of water and soak along with red chillies for 30 minutes. Drain completely and grind the dals along with red chillies, asafoetida, salt to taste and curry leaves into a coarse paste. Do not add water while grinding. Grease an idly mould, take a lemon sized ball of the ground mixture and pat into the idly grooves. Steam for 6 to 7 minutes. Let this cool then pulse it in the mixie again, so that it becomes a fine powder. Keep aside. In the meanwhile, heat a kadai with oil splutter with mustard seeds and urad dal. Once the dal turns golden, add the chopped beans, turmeric powder, and salt to taste. Mix well and cook covered, without adding water. Keep stirring once in a while. Once the beans is done, add the ground dal powder and roast for 6 to 7 minutes on low heat.